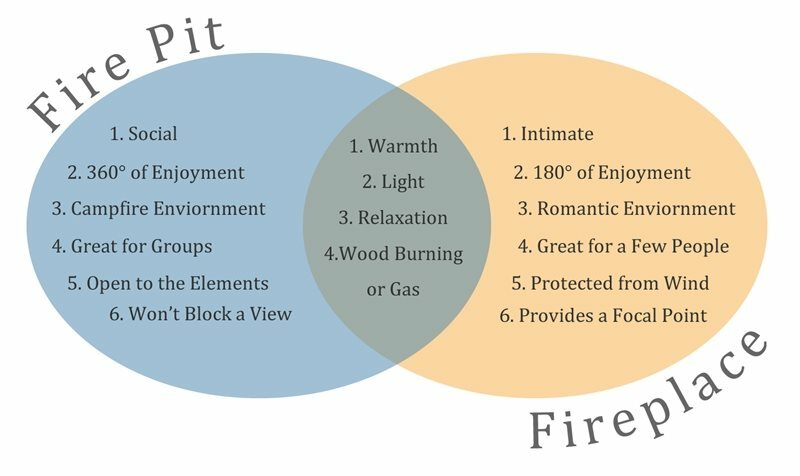 Fire pits vs fireplaces – click to enlarge. 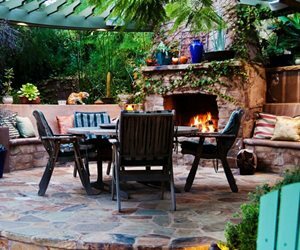 You built your patio to extend your living space beyond the walls of your home. You created an enticing outdoor room or two with furniture cozy enough to suit your living room but durable enough to withstand the elements. Maybe you're constructing an outdoor kitchen that goes beyond a simple charcoal grill. And, of course, you have plants. Still looking to spice up your outdoor life? 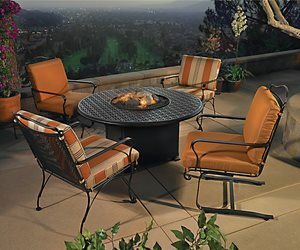 Whether your backyard dreams involve bundling up for a chat with a couple of close confidantes, nestled on a cushioned outdoor love seat, or invite the whole gang over for s'mores and ghost stories, the solution is the same: Just add fire. If you're looking for design flexibility, you could be moved - so to speak - by a portable, standalone fire pit. These models offer a sort of a campfire feel. Because you can place them anywhere, they offer 360-degree access, which makes them perfect for group gatherings. Which enables maximum conviviality, extra-loud "Kumbaya" singing and an unlimited number of people who can get their marshmallow-roasting sticks into the mix! 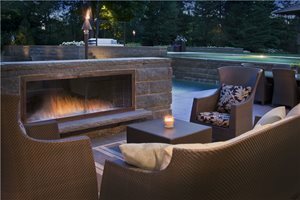 Standalone fire pits may not have the anchored, homey appeal of a built-in fireplace or fire pit, but that doesn't mean they can't be elegant in their own right. You can get them in industrial-style metal, mesh, stone or even polished copper for a look that suits you. 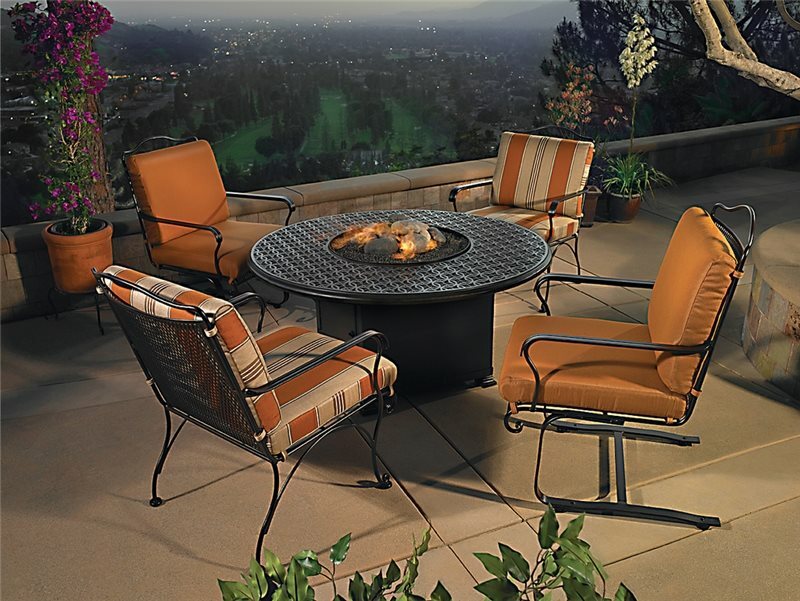 Some higher-end fire pit models are powered by a natural gas source, but most use wood for fuel. the convenience factor. 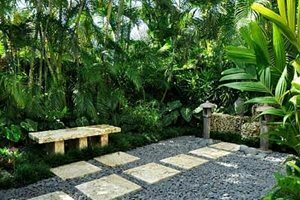 The ability to move the unit easily means it'll be less of a hassle to clean, with the added bonus of being able to experiment freely with your backyard's feng shui. 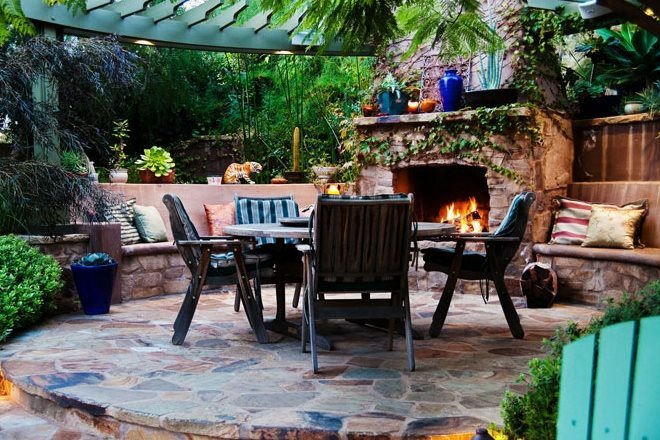 If you're feeling a bit more attached to your outdoor design, a built-in fireplace might fit the bill. Fireplaces create an intimate hearth feeling and can invite lively (yet civilized!) conversation among a small group of people. 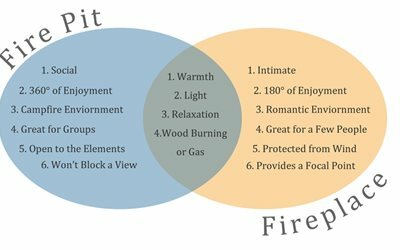 One advantage to built-in fireplaces is that they're protected from the elements - namely wind, which can kick up embers and shift the direction of the smoke - and direct smoke upward and away from your guests' faces. That protection will also make it much easier to light. 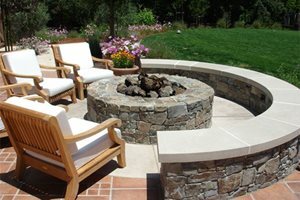 As far as materials go, you'll be building out your fireplace in a material that matches or coordinates with the other materials in your outdoor space: brick, stone, marble, tile, you name it. Aesthetically, the sky's the limit. Some are wood fueled, and others are hooked into your home's natural gas line just like any indoor fireplace would be. But before you go worrying about what the future owners of your current home will think, just focus on enjoying the bright flame in your backyard, regardless of the season.